Planning a trip to Paris in the near future? Well, you’re in luck. 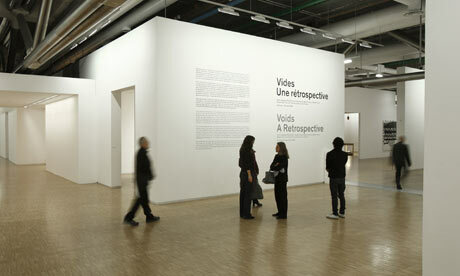 For the not inconsiderable sum of 12 Euro, you can visit Centre Pompidou’s latest exhibition, Vides [Voids]: A Retrospective. You can even buy an advance ticket online! And that ticket will give you privileged entry to… nine empty rooms! With floors! And walls! Could this be THE blockbuster exhibition for the global recession? All those nasty expenses that render large travelling exhibitions prohibitively expensive – insurance, freight, installation – gone in one fell swoop. Ah, the look of relief on the face of the Registrar as this exhibition rolls into the loading dock. The gift shop will have had a hell of a time coming up with marketing concepts for this one, though. Although the colour separation costs for printing the postcards, posters and catalogues will be modest by usual standards, I’d imagine. Minimalism? I can’t get enough of it.